Circle Flip is a premium WordPress responsive multipurpose theme that is the first of its kind in adding a unique Drag & Drop Header builder to it’s list of amazing features, including the user friendly Page Builder, Powerful Theme Options, and a selection of pre-built layouts. It is the first of its kind in which it gives the user a new way to build a perfectly customized header. Users can create rows and choose which are sticky and which are not. Users can even select which header shows or disappears on mobile responsive views, add menus and set them to toggled, or choose their alignment from left to centre and right. Create a specialized header for a specific page, add a slider before or underlying your header, or simply set the forever beautiful transparent header. Rows: where you can add as many as you want your header to have, and set different options to each one; height, background color, content color, sticky or not? And if you want to disable the sticky function on mobile devices. Logo: You have the option of using your previously defined Logo, or add a different logo right on the spot. Menus: add a chosen menu to your chosen row on your chosen header, and set to be a toggled one, and define its alignment. Social icons: set your different social icons to display them on your header. Text: specially useful if you want to add a contact email or a link to contact page, or simply for showing your brand’s tagline. Button: for easily adding a ‘Sign Up’ or ‘Buy Now!’ buttons. Ad: set a linked image on your header to showcase your sponsors products or websites. Spacer: just in case you needed an empty space between any of the elements in your row. Breaking news: an easy way to set an attractive, eye catching scrolling bar showcasing your latest articles and news. Circle Flip’s Page builder is not your ordinary confusing, frustrating content builder. Extremely user friendly and fully documented, covering all your needs and fully responsive. Circle Flip’s Page builder consists of a comprehensive set of blocks that includes, but are not limited to; Columns, Posts Block, Gallery, Shortcodes, Testimonials, Team members, Offers, Filtered Google Maps, Clients’ carousels, Tabs and Toggles and many more. 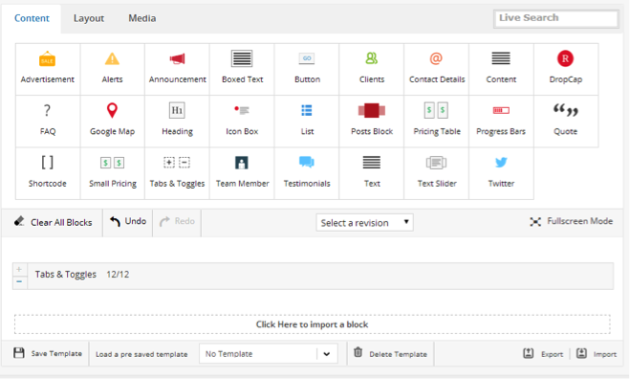 Check out the full list of blocks available and their complete options set at the content page builder page. 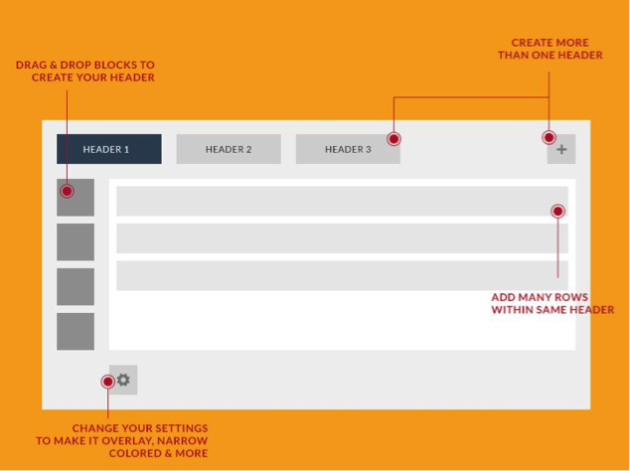 Circle Flip provides you a full demo access to the drag & drop Page builder. Users can create, edit, and publish pages for free (Try it before you buy it!). 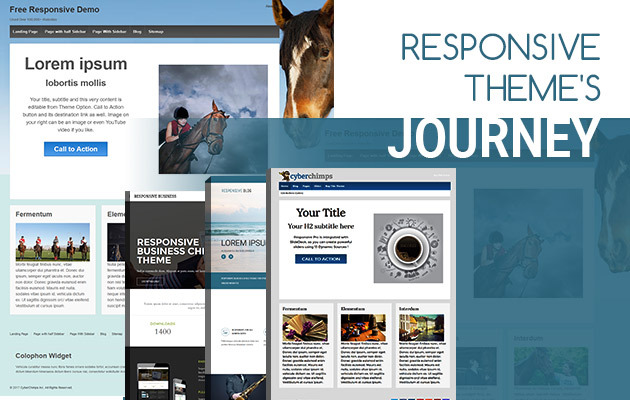 Go ahead and edit a page and get the feel of how easy it is to use the theme for yourself, login at themes.creiden.com/circleflip/builder-demo/wp-login.php using the user name: demo and password: demo. In addition to 8 amazing ready layouts for multipurpose use, Circle Flip also added a travel layout that suits all travel and tour agencies. Now Circle Flip has ready layouts for E-commerce, Hospitals, Engineering, Schools, Law firms, Magazine, one page websites, hosting, and the newly added Travel layout. That’s in addition to a spectacular support team, which has been highly ranked by almost all users. Check out their customer reviews on Themeforest, and check their Support in action at the dedicated Support Forum and don’t forget to check the Circle Flip Online Documentation website. Creiden is a leading Web-Development Company; dedicated to deliver creative solutions for Web Development and Design. Creiden stands for Creativity In Design [spelled “kraiden”]. That’s because creativity is our main aim in every design we make whether its a visual or code structural.